Rabi, Joe and Miguel live in a small town in corn-country Iowa. Not exactly ground zero for a zombie apocalypse but when the local meatpacking plant starts cutting corners and pumping the cows with all kinds of drugs, mayhem ensues. Paolo Bacigalupi’s novel is a whole lot of fun, but he also packs quite the socially conscious message. It’s basically Fast Food Nation for a much younger audience. I’m not sure if many people will appreciate the aggression towards the meat industry that this book takes but it reminded me why I’m a vegetarian. I really liked how the zombies resulted in real world circumstances and not so much in fantasy. It added a level of fear, like hey this could happen. 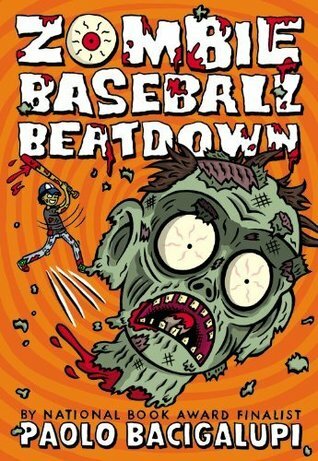 This entry was posted in Middle Grade, Zombie and tagged Middle grade reader, Paolo Bacigalupi, Zombie Baseball Beatdown. Bookmark the permalink.